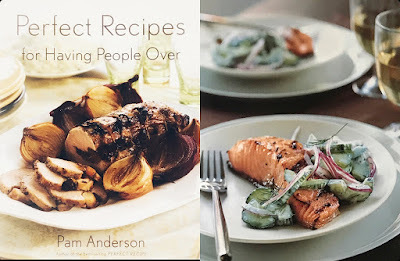 Salmon and cucumbers have a classic affinity-throw some dill in the mix and you have a harmonious dish that is mouthwatering, especially if the salmon is grilled and the cucumbers and dill are combined with sour cream to make a delicious cooling salad. 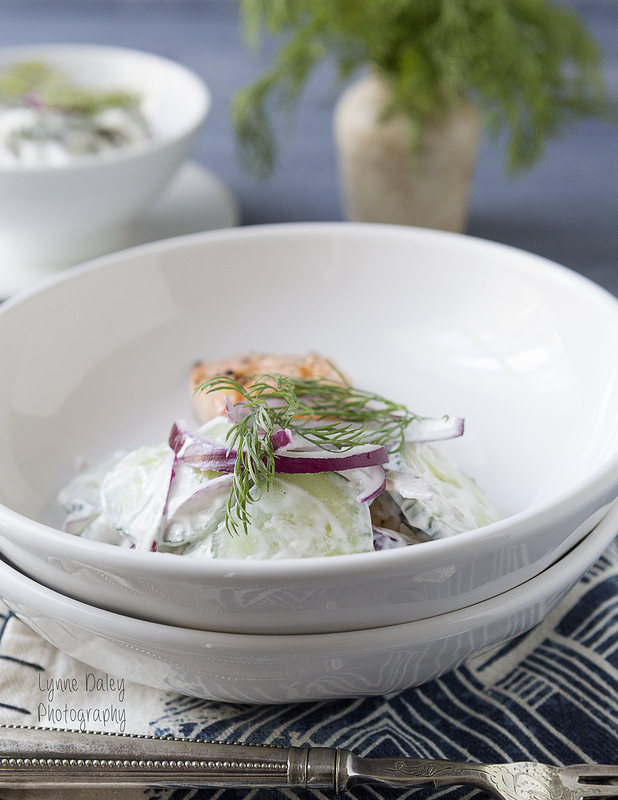 This Scandinavian inspired dish can be a light lunch or a main course with perhaps a rice or pasta side dish. For a colorful summer meal, serve this gazpacho. 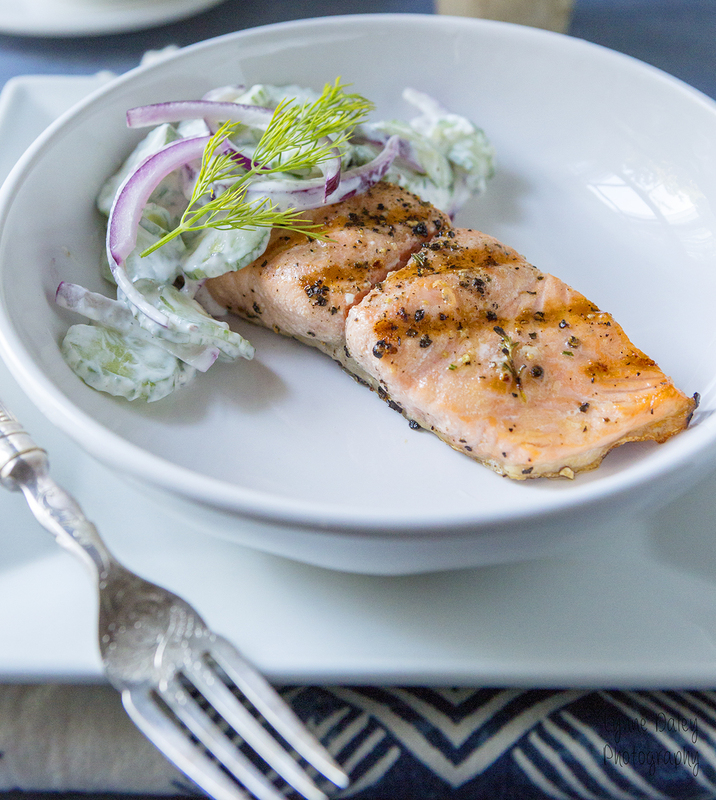 The cucumber salad can be made a few hours ahead and the salmon takes minutes to grill. The salting and draining of the cucumber is crucial as the salad will become watery otherwise. Place the sliced cucumbers in a colander and toss with 1 teaspoon salt. Let stand over a bowl for 30-45 minutes until several tablespoons of juice has drained. Pat cucumbers dry and place in a medium bowl. Add the red onion, saving a few slices for garnish, the sour cream, vinegar, dill and pepper to taste. Toss lightly to coat. Refrigerate while you prepare the salmon. About a half hour before serving, heat gas grill on high for 10-15 minutes. Clean the grill grate, then using tongs to wipe an olive oil soaked paper towel over the grill rack to prevent sticking. Careful not to set the paper towel on fire. Close the lid and return to the high temperature. Using the olive oil, brush both sides of the salmon liberally, then season with salt and pepper. Grill about 3 minutes a side, until just opaque. Serve hot or warm. Plate the salmon and spoon the cucumber sauce alongside the salmon. Carla Emilia is host for second course fish dish from Menu Lib-e-ro, when completed with be a compilation of various courses to mix and match. A brilliant idea from my Italian blogger friends Marta (great idea) and fulfilled by Aiu. Thank you so much, Lynne!! !